All mothers in the breeding line are awarded with the STAR predicate. Udo is a very special and handsome Friesian gelding with long mane and thick tail. He is a honest, safe/bombproof and beginner friendly horse. Udo has a good conformation and nice movements. He is well ridden, safe and bombproof to ride and handle and he is experienced in dressage. He has competed at level 2 indoor/outdoor and is doing shoulder in and out and half passes to the left and right. He is also used for trail riding, hacking out in the woods and on the roads with traffic. Udo is extremely friendly, very easy going, sweet around children and loves to cuddle. He is also very easy to mount and comfortable to sit on in trot and canter and he is not pulling and is light in the mouth. Udo has a lot of experience and is easy to load and travels safe in a lorry and trailer and behaves very well with the farrier. A great family horse but also the perfect horse for dressage competitions! Durk is a beautiful friesian *STAR* gelding. He is honest, safe, bombproof and beginner friendly. A perfect gelding for dressage, recreational riding and professional driving like weddings and funerals. He has a lot of experience in driving with a carriage and marathon wagon and he knows all types of road traffic and farm animals. Durk is also used for trail riding (hacking) on the roads and in the woods! Geert is beautiful black Friesian gelding with fantastic movements and he has an extremely easy going, friendly character and a lot of experience! Geert has a big size of 1.66m. He is very easy to ride under the saddle in dressage, hacking/trail riding and also on the roads in traffic (he knows all traffic; big trucks, tractors, busses, motorbikes). Geert is also driven with a marathon wagon, so he also knows water crossings and bridges. A great family horse! Jaron is a good looking and very special Friesian gelding with beautiful long mane and tail. This gelding is 100% safe and bombproof to ride by all kind of riders. He is used for hacking, trail riding in the fields, the woods and also on the roads in traffic. He has a lot of experience, is trained in dressage and also went to competitions! Jaron has a very sweet and calm character and is good with kids and knows all farm animals. He has a very soft mouth and therefor very easy and light to ride. Jaron has 3 fantastic gaits and an exceptional canter. A great family horse, 100% safe and bombproof to ride by all riders, from beginners to experienced riders! Goffert is a "dream" of a Friesian gelding with beautiful mane and tail and a great character. Goffert is 100% safe and bombproof to ride under the saddle, also in traffic, by beginners, amateur riders and riders who want to ride him in dressage competitions. Goffert is soft in the mouth and light to ride. He has 3 very good gaits. Goffert is also driven with a marathon wagon as well on the roads in traffic. Ridzert is a very good looking friesian STAR gelding with long mane and tail. He won the famous STAR premium award in 2008. Ridzert is very easy to ride also by amateur riders and he has a friendly easy going character. 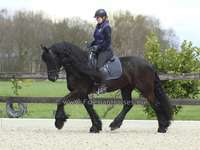 Ridzert is a Friesian gelding you can use for dressage and as a "family" horse.